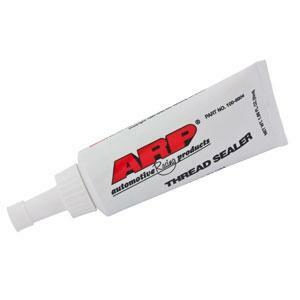 ARP Thread Sealer is a premium grade thread sealer that is designed for use on all wet deck cylinder block applications in order to prevent coolant leakage past the head bolt threads, while duplicating the recommended installation pre-loads associated with all ARP cylinder head bolts and studs. ARP thread sealer can also be used on pipe plugs, pipe fittings, fuel line fittings or any fitting that requires a flexible leak proof seal. ARP thread sealer is designed for use on aluminum, steel, stainless steel and plastic materials against coolants, water, gasoline, oil, natural gas and LPG. PTFE based w/rust & corrosion inhibitors. Effective range: -30˚ to 550˚F. Sealant range: 10,000 psi (pressure). Application: delivers a flexible leak-proof seal in aluminum, steel, stainless steel and plastic against coolants, water, gasoline, natural gas and LPG.